Belt sanders are powerful tools that are indispensable for a modern day woodworker. Although they are rarely used for metalworking purposes, it cannot be said that a blacksmith wouldn’t find any use for that either. These machines usually use a motor to spin a strip of sandpaper at high speeds to corrode away the surfaces of the items to be used on them through abrasion and high friction. A belt sander isn’t a tool that one might need in their everyday life. However, it’s one of those things that can actually make your job a lot easier in some way. For example, by peeling a paint off an item, or by removing rust, or by smoothing out an object. But the most important use that one can have in their everyday life with a belt sander is not only for making a knife, but also for sharpening it. If you’re finding it difficult to cut vegetables with your kitchen knives or to butcher meat with your cleaver, you can easily fix that problem with belt sander knife sharpeners. Let’s look at the steps necessary to sharpen your kitchen knives using a belt sander. First of all, you need to prepare yourself for the task. Make sure that you have a 100 grit sandpaper ready for the job. For most of the sharpening tasks, 100 grit will be more than enough. But if you’ve got a hunting knife or something made of high-carbon steel or other tougher materials, it’s worth keeping a 50 grit sandpaper handy too. Also, if you’re looking for the sharpest possible knife with a smooth finish, get a 200 grit belt. Attach the selected sandpaper to the belt sander and turn it on to its maximum speed. Remember, the lower the grit, the rougher the surface; hence, having a more abrasive effect on the knife. With that in mind, pick up the knife, chisel or the material you want to sharpen, stand before your belt sander knife sharpeners, and you’ll be ready to sharpen it. As we’ve already mentioned about tougher materials requiring a rougher grit, you should start off with a 50 grit sandpaper for such tasks. Start off by holding the knife down onto the moving belt knife sharpener with the sandpaper on it, placing it completely flat against it. Then pull the knife towards you while changing the angle of the knife up to 30 degrees, using the sharper side as the pivotal point. Remember to complete this motion in no more than a second or two; otherwise, you run the risk of corroding away the material and reducing the lifespan of your knife. Now, repeat the same process on the knife on the opposite side. Keep repeating this process and touch the edge a little to determine the sharpness. Once you’ve got your knife close to the required sharpness, it’s time to up the grit a bit. Change the belt to a finer grit, preferably 100 or 200. If you’re just starting out with knife sharpening, you should probably go in steps like 50 grit and then 100 grit and so on. But for people who are used to sharpening knives on a sander, they could just get the desired level of sharpness on a 50 grit sander and then fine tune the edges with a 200 or a 300 grit sander afterwards. Regardless of which grit you choose next, you’re going to have to repeat the same process again. However, this time, you should opt for a lower angle when sharpening on your belt sander knife sharpeners. You’re looking for much smoother results now and not just a course abrasion. Repeat the steps a few times on both sides and you’ll be ready. The process of sharpening is the same for every type of knife, however, they all require different grits and techniques. Check out our article on sharpening knives without a sharpener or whetstone to find out more about different types of knife edges and how sharpening them requires different techniques and grits. But on a belt sander, it’s much easier than that. You can just take any knife and sharpen it with a straight edge without any problem. Another thing to remember is the cases where you have nicks and deformed edges, things get a bit complicated. For nicks, you’ll have to use a very rough grit, like 25 and file the edge down till the nicks are gone. In order to do this, just hold the knife onto the sander at 90 degrees, applying a slight pressure to file it down. Once the nicks are gone, follow the standard procedure with a 50 or 100 grit to sharpen it up. For twisted or dented damages, just follow the standard procedure of sharpening knives for a longer time. Once done, turn off the sander and lightly slash the knife onto the sander at 90 degrees to clean off the residual dust and bits. Do not touch the belt with your hands while your belt sander knife sharpeners are running. Do not increase the angle of the knife while sharpening; otherwise, you’d end up making it more blunt. While testing the sharpness of the knife, just touch the edge if you have to. Do not swipe your fingers against the edge. Do not keep the blade on the sander lingering for too long; otherwise, you’d abrase the end and reduce its lifespan. Do not use the belt sander to shape metals, unless you want to keep changing the belts over and over again. Belt sanders are meant for woodworking and some basic metal sharpening. 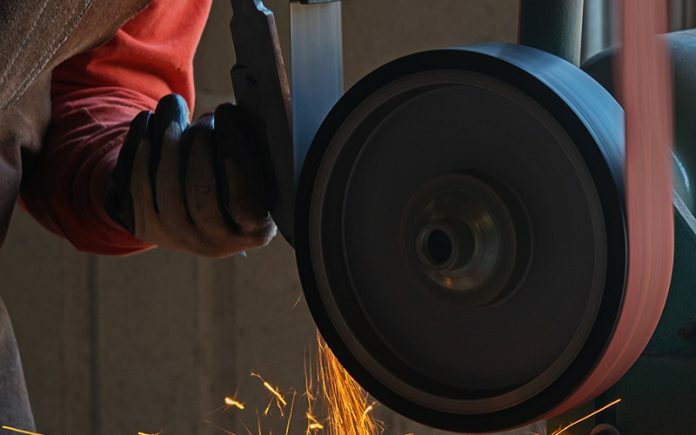 If you’re looking to shape metal, go for a belt grinder instead. If the knife is old and rusty, you need to make the judgment call to discard it rather than try to sharpen it. This is because weakened blades might break off unpredictably during the process, hurting or injuring the user in the process. Sometimes, it might help to moisten the blade during the sharpening process. It will serve two purposes – the heat caused by the friction would be cooled down and the water will work as a bit of a lubricant, helping you move the knife on the sander more easily without getting any unwanted jerkings. As always, keep your knives and any other sharp objects that can be found in or around your home away from your children and pets. It’s always worth learning knife sharpening techniques, whether it’s on a belt sander, grinder, whetstone or just on a rough surface. It’s one of the essential skills that everyone should know, just like fire starting, cooking, and triage. In general, the motion required for grinding the edge of a knife into a sharp one is usually the same for all straight-edged knives, whether it’s on a belt sander or a whetstone. From this article, we’ve learned the proper way to do it. So, whether you have a belt sander or just a decorative stone in your garden, you’d be able to use this same technique to sharpen your knives for that razor-sharp effect. Or you could even get a regular leather belt and use that as a belt sharpener as well. It’s all in the technique. Previous articleCrossbow vs. Compound Bow: Which One is For You?